My name is Danielle Da Silva and I'm a photographer and aspiring filmmaker who loves learning, travelling and looks at everything with a critical yet optimistic eye (a difficult yet not impossible balancing act). I'm also the Founder/CEO of Photographers Without Borders (PWB). I have an MSc. in Environment and Development from the London School of Economics, an Honours degree in Conservation Biology, Psychology and Global Studies from the University of Western Ontario, and I have a Rainforest Biodiversity certificate from the University of Toronto; however the most important part of my education is my experience travelling and working all around the world. Of the more than 50 countries I've visited, I've spent most of my time in rainforests and jungles by choice, and it's safe to say that I'm rainforest and sustainability-obsessed. This past January in 2015 I accompanied our photographer Gita Defoe to Sumatra, Indonesia on a photo assignment to document the work of the Orangutan Information Centre (OIC) for PWB. I instantly fell in love with the people who run this project, the wildlife and habitat they serve, and the island of Sumatra. Our first few days were spend photographing orangutans in the wild. What a treat—we were able to spend time with a particular female named Mina and her two babies for hours on end. We even became part of her entourage and followed her as she chased tourists. Next we visited a reforestation site where OIC had reclaimed palm oil plantations that were illegally encroaching on conservation lands, and we witnessed the magic that can happen in just a few years of reforesting a site with the help of hard work and dedication. Then things got real. We were invited to come along on a rescue at a theme park where a baby orangutan was being poorly kept in a dirty cage at the back of the park. We had learned during our trip that baby orangutans can only be obtained by killing their mothers. Such is the human-like protective nature of a mother orangutan. It was devastating to realize that this small baby had lost her mother in a violent struggle with humans to live in a filthy, tiny cage. I will never forget her tiny hand holding onto mine, her brown eyes looking into mine much like a human child. Thankfully, after some struggle, the OIC team was able to rescue the orangutan and we took her to a rehabilitation centre. Panut and his team named her Cece. Next we went to the Medan Zoo to photograph the orangutans they have (illegally) in their possession. Seeing the orangutans in a small house-like structure, chewing on plastic bottles with no trees to swing on, brought tears to my eyes. Stripped away of some of the glamour of modern zoos, I was humbly reminded of what zoos really are—animal prisons that commodify animals for our entertainment at the animal’s expense. After witnessing orangutans in their natural habitat playing, climbing, swinging for long stretches…I realized that if we are to enjoy wildlife and nature, it should at least be in the wild—not in zoo cages—and without fearing that if we do so that they will be mercilessly killed by the human species. This experience, without a doubt, brought me closer to the jungle I love and reminded me why I decided to pursue my education the way I did, and it sobered me to the realities and challenges we face on a global scale. Many times in my life I have had to act for the mere fact I feared others wouldn’t, and that someone could get hurt as a result…there have also been times when I wished others had acted when I needed help, and they didn’t. We have to be the ones to act, because nobody else will. Photographers Without Borders is my baby, and now this cause, to preserve a piece of Sumatran rainforest for the sake of the animals, the planet, and even ourselves, has come to life. I hope you will be a part of this journey and know that by becoming a part of this and supporting this, you will always be honoured and welcomed. Thank you so much for your support! Every little counts. This holiday season, why not make a donation for yourself or as a gift for someone you love? Hi there, my name is Gita Defoe and I am a photographer from Burlington Ontario. I was born in Pomalaa, a small mining town in Southeast Sulawesi, Indonesia. Because of my father's job, we moved quite often. We have lived in Maluku, Papua and finally settled in Bintan, Indonesia, a small island 40 minutes from Singapore. Growing up in smaller cities and because of the encouragement of my family, I developed a passion for nature. On weekends, my father would wake us up early to go for hikes and to explore the rainforest and its inhabitants. On one of these early mornings when I was 10 years old, I remember hiking up a volcano. I was in awe when I look down and saw how small the houses were, the world is a big place! When I moved to Canada 15 years ago, my love for nature continued to grow stronger and as a photographer, I always try to capture the beauty of it. 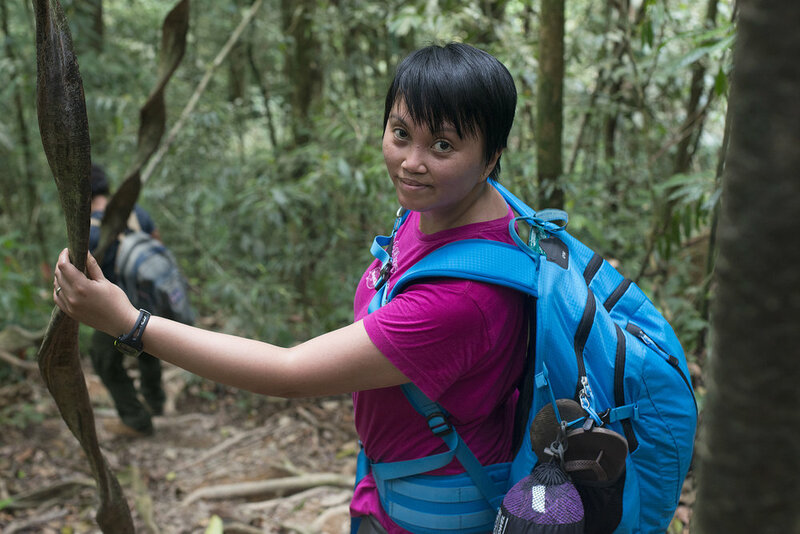 During my free time, i love to explore hiking trails, camp and learn about the environment. I am the happiest when I am out on a trail or in the middle of nature. This past January I went back to my home country, Indonesia, on a photo assignment on behalf of Photographers Without Border. 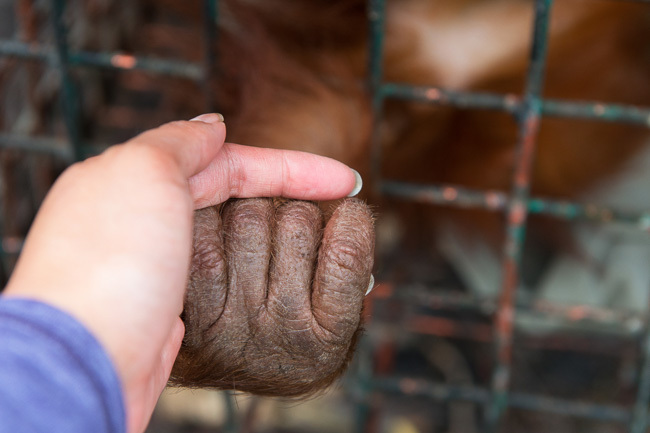 Together with Danielle Da Silva, we documented the amazing work that the Sumatran Orangutan Society(SOS) and the Orangutan Information Centre (OIC) have done in Sumatra. Spending 2 weeks with these amazing people and being in nature made me feel at home. It also helped me realize that I could do so much more! This project is an amazing opportunity and I couldn't be happier to be a part of it. We all have a chance to do something special here. Something for our future generations, for the survival of these endangered species and for our beautiful world in general. My name is Matt Defoe and I am from Burlington, Ontario. For as long as I can remember I have always been fascinated with nature, animals and the environment. My full time job is in the environmental field where my duties include protecting nature. During my free time you can find me on some of my favourite hiking trails trying to spot and identify a bird I have never seen before or watching deer roam through the forest. I also love to travel and have had the good fortune to travel to Indonesia on several occasions. I have always felt welcomed in Indonesia, so welcomed that Indonesia has become my second home. I am extremely excited and honored to be a part of the Sumatran Wildlife Sanctuary. This is an opportunity for me to combine several of my passions into one amazing worthwhile project. Not only will I be involved in conserving a unique ecosystem but will also have the chance to protect some critically endangered animals, letting them live the life they were meant to live. What also excites me about this project is that I get to give back to the people that have made me feel at home in Indonesia. I look forward to having you join me in this journey. So I decided to donate to this cause for two main reasons. The first being that one of the people behind this initiative is my best friend AMQ. EVERYTHING she invests in is fueled with a passion an energy that is often contagious, and this cause was no different. Secondly, this cause gave me an opportunity to support something bigger than myself and society. It provides a different kind of rewarding feeling to contribute to something that has an impact that resonates in more ways than we can often imagine. I donated to the Sumatran Wildlife Sanctuary because I believe in activism and supporting initiatives that are driven to save our planet and support sustainability for our future. We need more people like you and in turn it inspires others to do the same. No initiative is too big to take on. Keep it up! I'm proud of Amanda, Danielle and the whole team. My donation is going towards an important, sustainable initiative that is going to help the animals it touches, and by extension, our planet. I'm looking forward to seeing them progress towards their goal. There is nothing that inspires me more than people living out their dreams. Whether it’s pursuing a career they adore or fundraising for a cause they feel passionately about - there is actually nothing I love more than seeing people passionate about life. Reading the excitement in Amanda’s voice when she talked about the Sumatran Wildlife Sanctuary made me want to jump on board immediately. It’s all about helping great people do great things, and Miss Amanda-Marie Quintino is definitely a great person doing something absolutely great. And that is something that I will always support! I am proud to be a supporter of an organization that aims to conserve land and protect the Gunung Leuser ecosystem in Sumatra. It is chilling to see how much rainforest land is continually being cleared away, all for the sake of palm oil production and agriculture. In Indonesia, millions of hectares of forest have been sacrificed, resulting in the destruction of vital wildlife habitats. I'm glad to be able to help preserve some of this land right now and appreciate what this organization is doing to protect this rainforest area and the many species that call it home.